On Friday 31th of March we hosted the album release of ‘Love-Letters to Strangers’ by Graciela María. Afterwards Broshuda and Doom Chakra Tapes took over for the rest of the night. 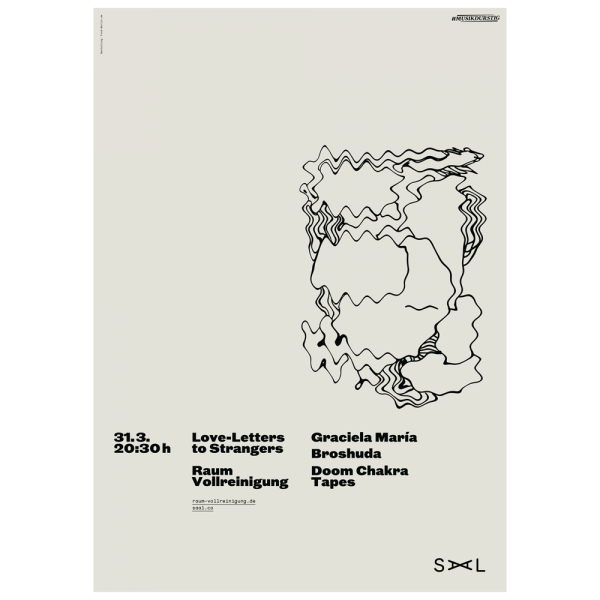 The event was organized by Saal, a freshly founded music agency, specialized in events management and booking, based in Berlin. Graciela María is a Mexican-born singer and songwriter, based in Berlin. Having lived in Mexico City for many years, she was part of the Mexican electronic music scene and made music with local producers. In 2009 she moved to Berlin, the city that mostly influenced her music and the place where she growth as an artist. She has performed in popular events throughout the world, including Berlin Next in La Gaîté Lyrique, Sónar Festival and Magnetic Fields. Her upcoming 3rd solo album, “Love letters to Strangers” is a deeply intimate work; spoken word, fragments of memories collected on field recordings and her undisputed signature of deepness and nostalgia make this album a very honest piece. Broshuda has flirted with a number of sounds and genres over the past few years, skirting the periphery of everything from Los Angeles’ beat scene to soupy, washed out house and techno and the nebulous regions of post-rock and krautrock. Doom Chakra Tapes is a label based in Berlin, part of the music collective Wild Open Space. Doom Chakra tapes give special attention to tape releases, while Wild Open Space has a focus on vinyl releases of electronic music. It´s run by Phil Madeiski, Max Weber and Felix Tutzer.